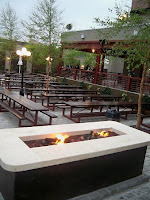 Fooditka: Studio Square Beer Garden - Now Open! 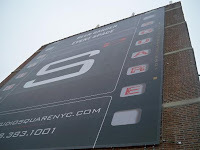 Studio Square Beer Garden - Now Open! Thursday night marked the much-anticipated opening of Studio Square beer garden, the second beer hall in Astoria but the first modern one of its kind in this neighborhood. Meg and I enjoyed a guided tour by Brooke, a Studio Square representative--and as an added bonus, we were also joined by fellow bloggers Ran and Daisy from Why Leave Astoria. A happy blogfest it was! The vibe is just incredible, and I love how sleek, modern elements are interweaved into a traditional concept of the beer garden. When you step inside, you're greeted by an open space with high ceilings and a beautiful bar made of rich brown African wenge wood. There's a large mural painted by graffiti artist, "KR One" aka Louie Gasparro, bringing an edgy/street element to the space. While the inside extends to an even bigger area with communal tables--a practical aspect for when the weather isn't cooperating--the outside sitting area is the real attraction. The first thing that you notice is the stone fire pit in front--it's contemporary but also a cozy focal point for gathering around. There are plenty of extra long communal tables everywhere, and one could comfortably seat around fifteen people (maybe more). I like that there are new trees planted throughout the courtyard, as well as ivy that will eventually snake around the large brick wall. Rumor has it that they will project movies onto this wall, which will be lovely in the summertime. 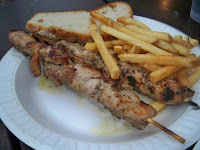 Chicken Souvlaki - As this place is partially run by Greek owners, we had high hopes for the souvlaki. I wasn't disappointed in the least, as the chicken meat was tender and grilled beautifully. I appreciated how juicy the meat was and out of all the other options mentioned below, this was the healthiest. You could add fries to every dish for an extra $2--they're incredibly crunchy and in my opinion, worth the extra calories. Pulled Pork - Made with Studio Square's signature BBQ sauce, the pulled pork is a rich sandwich. If you get this, you might not need fries. The meat was tender and moist but a little too runny. A highlight for me was the fluffy bun, which soaked up the barbecue flavors nicely. Cheeseburger - A solid choice, the burger is made with quality beef, making it a good option for traditional eaters. It's a tasty street-food burger rather than a gourmet one--but that complements what this place is all about. Once again, the bun was fresh, a perfect vehicle for the meat and cheese that gave this dish more substance. Kolbase - My favorite food of the night, I couldn't get enough of it. While I loved that we got it with sauerkraut and grain mustard, I could've eaten it without condiments. The quality of the meat was fantastic, with a hints of smokiness and spice. We found out that the sausage comes from a local distributor, Schaller & Weber, which is a family owned business operating out of Astoria since 1937. The incredible heritage of this product was evident. 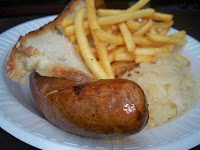 Weisswurst - A "white" variety of sausage, this one was a lot gentler and milder than the kolbase. I thought that it lacked a bit of flavor but that was just my opinion, as my dining companions preferred weisswurst to the kolbase. The fact that I grew up on kolbase, given my Eastern European heritage probably has something to do with my bias. Sangria - With 18 imported, domestic and craft beers on tap, it's a wonder that we selected Studio Square's house sangria as our liquid of choice. In our defense, the sangria was outrageous and just like their beers, it comes on tap, fresh fruit added at the last minute. I strongly recommend this drink--I loved that it wasn't overly sweet but it was the right amount of fruity. I detected a floral essence, reminding me of honey but it might've been agave. When I asked one of the owners about the recipe, he said that it was "secret." It was refreshing to see how hospitable everyone was--from the owners to the barmen to the kitchen staff. A friendly waiter cleared our plates after we finished our meal, something new to me in this type of environment, which is usually self-serve. The cost of food is inexpensive with most selections being $8. Adding fries will set you back another $2, still not bank-breaking. Beer is in the $7-$18 range depending on size, a pitcher being $18. Studio Square is a cash only establishment so make sure that you come prepared--but if you forget, there's an ATM on the premises. The Absolut Lemonade is also tasty. I HEART BEER GARDEN!